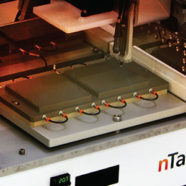 nTact’s core competence lies in their ability to apply their unmatched expertise in Slot Die Coating technology to non-traditional and challenging applications, and process requirements found in newly emerging markets. 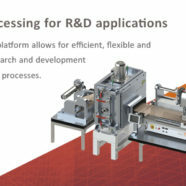 Regarded by customers are the best slot die coater system for R&D applications, the nRad offers a compact, yet high performance system and scalable technology with numerous options for development of a broad range of applications, at a fraction of the cost of standard production tools. 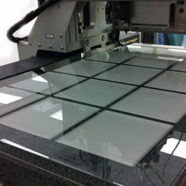 nTact’s nDeavor line of slot die coating systems offer solutions for fully integrated pilot and full production applications ranging from smaller substrate processing to larger substrates over 2 meters wide. These systems are available for integration with full robotic or conveyor-based automation. 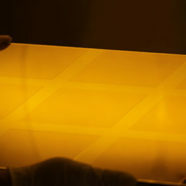 One of nTact’s newest innovations is the ability to slot die coat a defined array of rectangular shapes on a substrate via their selective coating or “patch coating” technology. 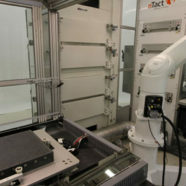 This innovation has become of great value for a number of applications, in some cases eliminating the need for subsequent removal or patterning processes.